Couple of weeks ago it was northeast United States, now its eastern Europe. I have from Friday evening to Sunday evening and a car. Where could I go? On the right there is one possible route, stopping (again) in Czech Republic, somewhere in Poland, and in the Tatra mountains in Slovakia. However, the drive would be very, very long and there'd be only an hour or two to ski in these places. Maybe its time to choose a more relaxed route. I do want to cover at least one new country, though. Poland is close, right? Is there snow in early April? Are the ski areas open? 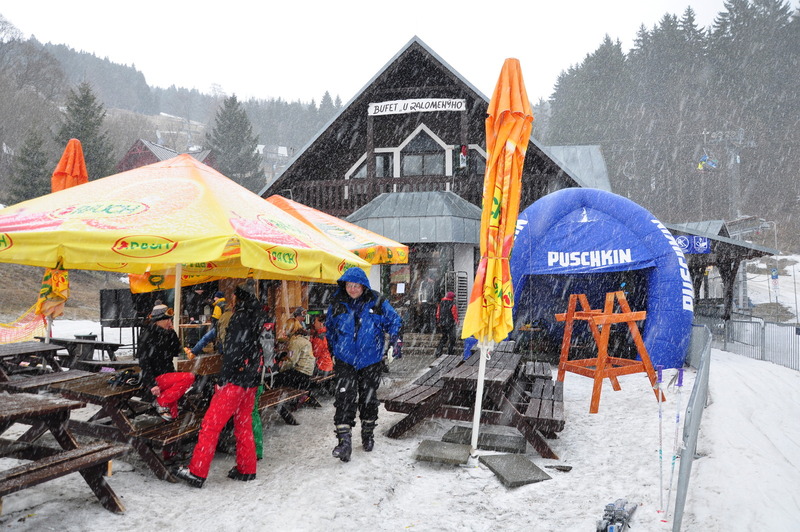 Or would it be better to travel to Slovakia and ski only there? Yesterday I skied at the Horny Donkey ski area. Well, Horni Domky. This is a small ski area in northeast Czech Republic near the border towards Poland. 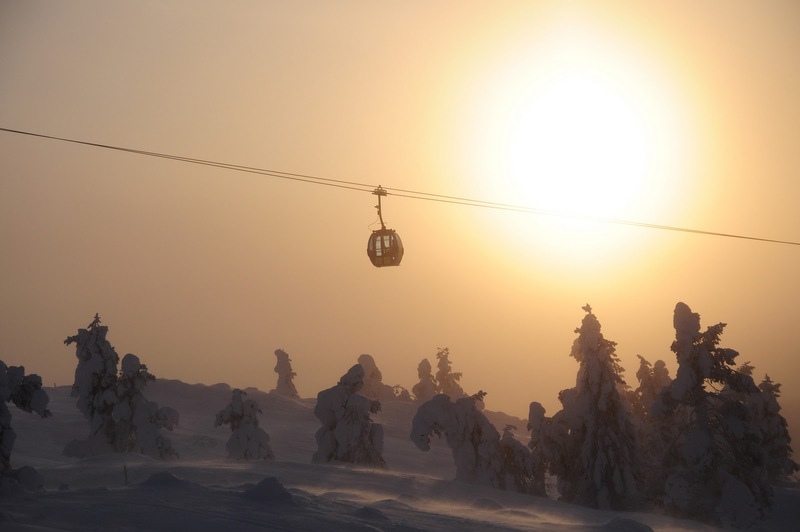 The highest ski lift goes to 1315 meters and maximum vertical is 690 meters. 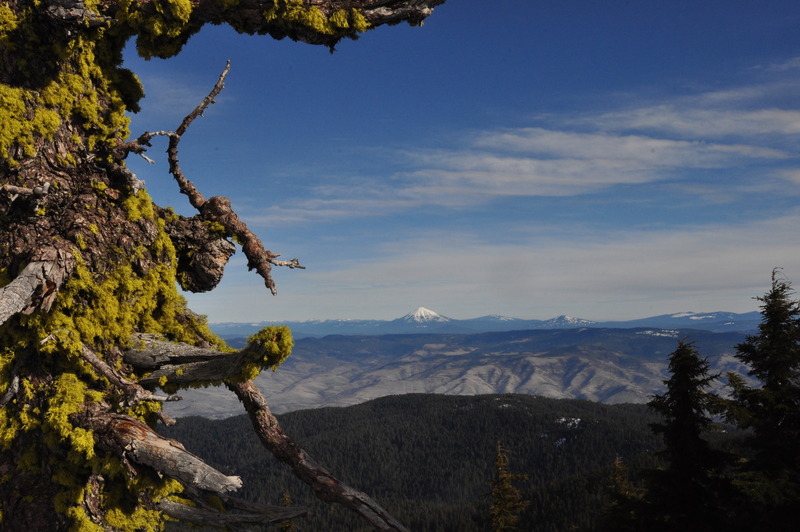 While small, the area modern, has two fast high-capacity chair lifts, and generally offers nice skiing. The ski area is a part of a group of nine ski areas in the western end of the Giant Mountains: Skiregion.cz. 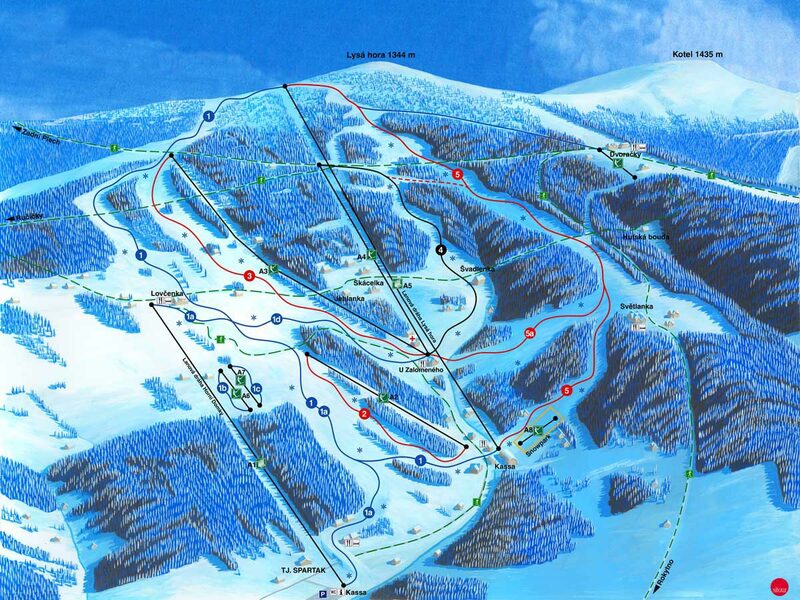 Together these areas have 36 ski lifts and one lift ticket works on all. My favorite ski run here is the "Slalomák", a steep red run that is best served not by the lift next to it but the slightly longer upper chairlift. The upper part of the mountain was still in winter-like form. Other good trails include the "Drevarská" (black) and "Cervená FIS" (red). 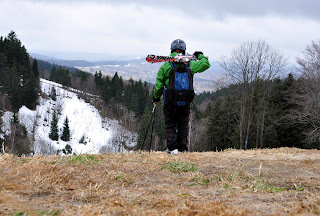 However, given the bad snow year in the central Europe and the fact that its the end of March, these slopes were already closed due to lack of snow. Not that it stopped me from skiing them, just that a different technique was needed. I was surprised that a wet, steep grass hill sticks to your skis and slows you down quite a bit. Steep is better in grass skiing then, too. And no, my skis did not suffer from this exercise. This was true grass, not sand or rocks. And it was lubricated by animal dung. I did have to give my equipment a shower back at the hotel, though. I also have to bring up the amazing Goulash index value in the Horny Donkey: 1.5€ for a bowl of Goulash soup. 1€ for beer. 24€ for a high-season day ticket, and we got our 5-hour tickets on a discount at only 16€. Skiing here is cheaper than staying at home and having to buy expensive groceries in Finland. Below you'll find a comparison of the Goulash index across some ski areas. I did not check accommodation prices (even if Pension Crazy sounded interesting), but it is clear that a day in Zermatt may give you a week in the Horny Donkey. 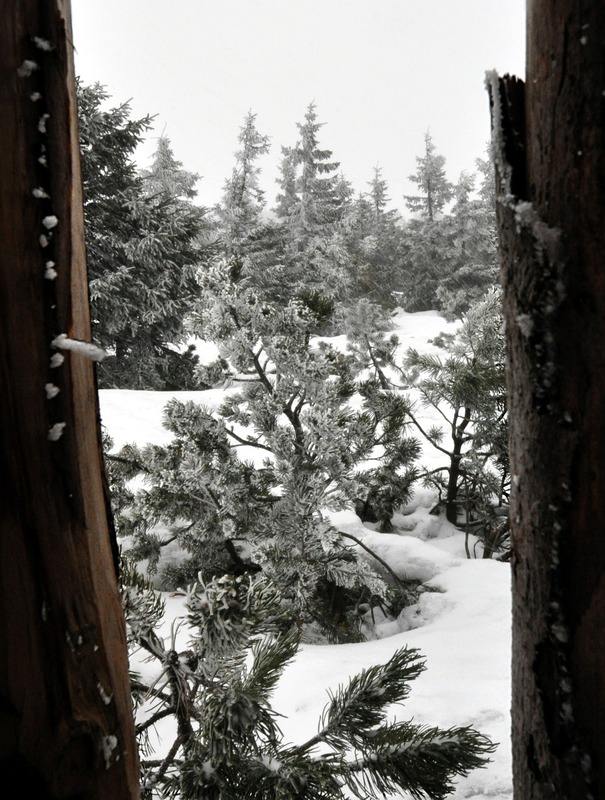 The best after-ski on the slopes takes place at the bottom of the Slalomák trail. This is the gathering place for many tourists, but also for racers whose race track sometimes occupies the Slalomák. The restaurant has tables inside and outside, cheap beer, music, outside grill, and all the other necessary ingredients to attract the crowds. 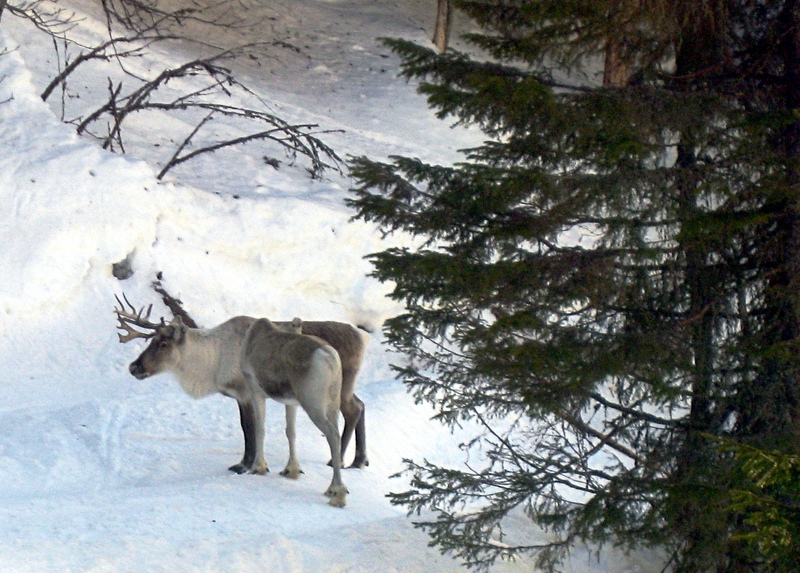 As far as I can tell, Åre is the best family ski resort on the planet. 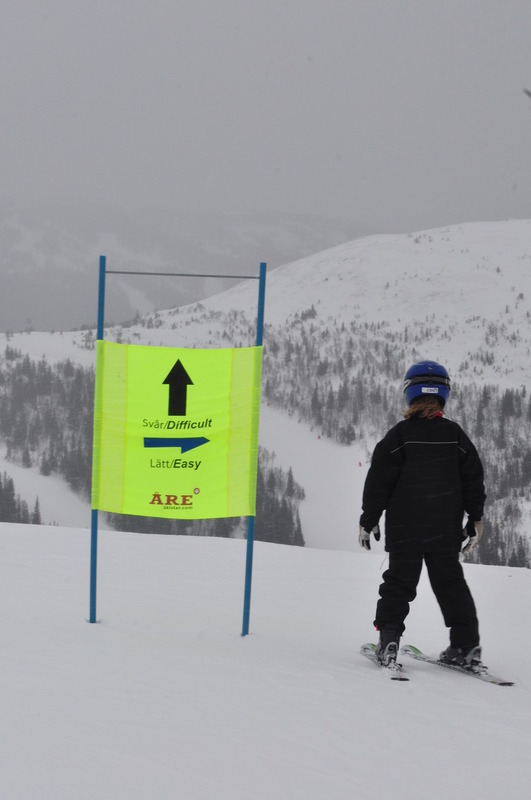 There are, of course, many ski areas suitable for teaching children. There are many resorts with family friendly facilities. However, small kids are unlikely to ski for a full day and they need other activities as well to keep them occupied. Other activities in the snow or hotel play rooms may help here, but for me Åre is special in that they have a full-blown kid-friendly indoor water park right in the biggest hotel, the Holiday Club. Many resorts have spas and swimming pools, but a large water park is rare. Anything that boasts seven different saunas can't be a too bad place to stay in! Hotelli Levitunturi in northern Finland comes up in my mind as a similar place, what they lose in the water park side may be offset by their very nice children's play house. But I can't think of any other examples in the world, can you? 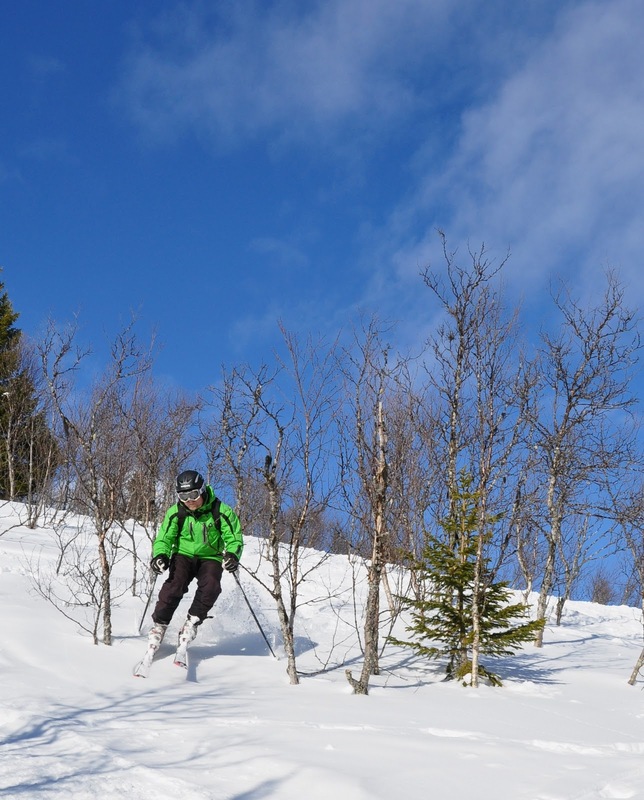 Large parts of Åre's ski area have easy runs that can be skied by beginners, particularly in the Björnen, Rödkullen, and Duved areas. 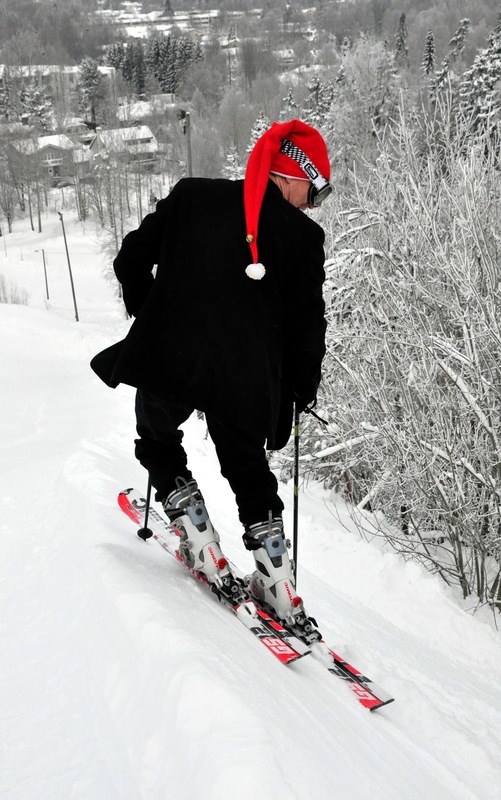 Skiing can even start right from the main village, but the runs returning to the village are mostly red and black, so with beginners it may be a better option to use a ski bus or taxi to go to Björnen, for instance. 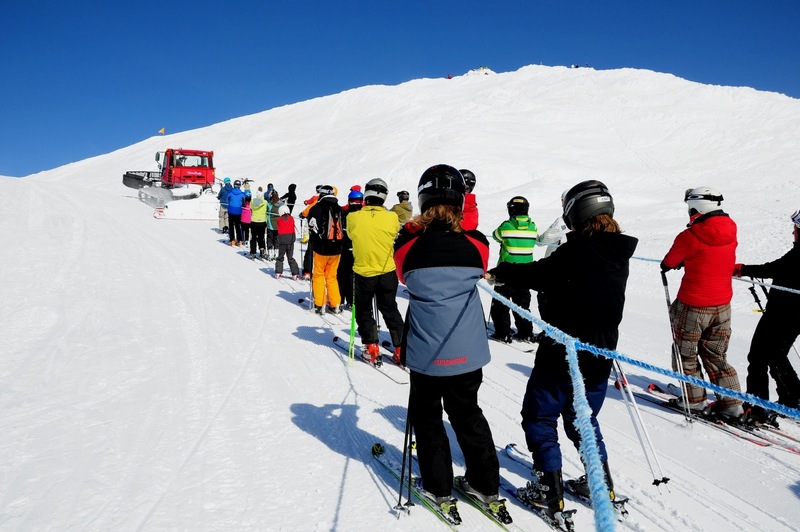 A taxi ride also removes the main downside of staying at the Holiday Club, having to walk a few hundred meters road uphill to reach the ski lifts. 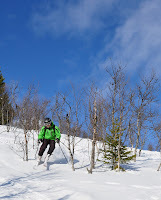 In any case, my youngest kid learned to ski the black runs on this trip to Åre. (Hey! My work as a parent is now complete, right?) Maybe I don't have to care about beginner slopes any more. But lets talk about skiing for adults. 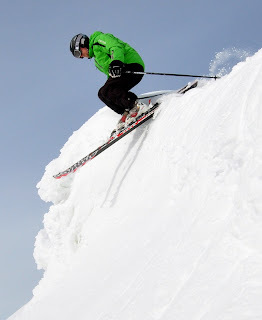 The main ski runs near the village are all consistently steep runs that are a pleasure to ski. My personal favorite is "Lundsrappet", a black run leading to the "VM8" eight-person chair lift. The upper parts of the mountain are largely open space, with wind-blown forms that are fun to ski. Despite its relatively modest size and round mountain forms, Åre has plenty of off-piste terrain. In good weather, snowmobiles or cats take skiers from the top of the highest lift to the Åreskutan. For 5 Euros, this must be the cheapest cat skiing in the world, along with Copper Mountain cat-included-in-the-lift-ticket deal, of course. At the top you will find a small cafe, a large radio antenna, and wind-blown Swedish mountain landscape as far as you can see. From the top you can choose multiple descents. 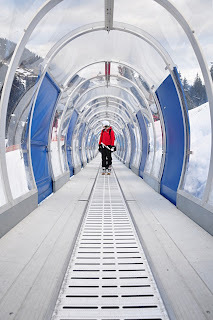 The path towards the lifts is the easy and safe alternative. A bit further away awaits Blåstensbranten, an extremely steep run. At 50 to 60 degrees, it should only be skied by experts. If you stand up on Blåstensbranten and extend your hand to the side, you will be able to touch the ground. A more easily reached off-piste area, "Västra Ravinen" is to the skier's left from the "Svartbergsleden" and "Hummelbranten". You can enter this area in the easiest way from the bottom of the "Tusenmetersliften", or alternatively going right from the Hummelbranten. 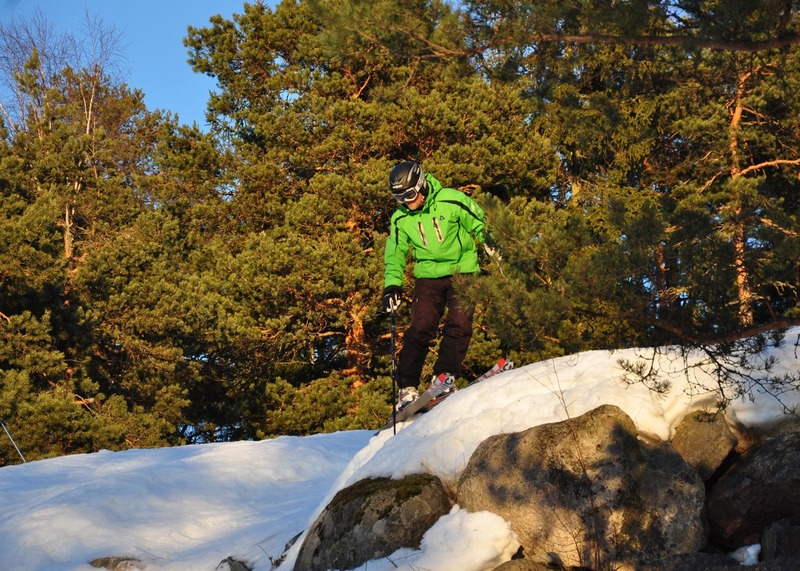 Entering from the top of the Svartbergsleden will take you the challenging Svartbergs off-piste. Make the exit to the left just before the traverse would take you to the right and down. 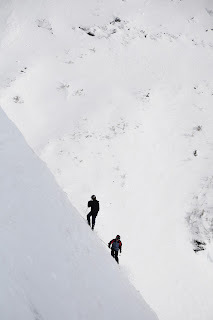 Svartbergs is also a very dangerous run, there is potential for a cliff fall, avalanches are frequent here, and in the wrong conditions a fall on this slope is a bad idea. I've seen a friend fall here in icy conditions and keep building speed all the way to the bottom 200 meters below (luckily he was unhurt). Return of the barfcam! (Thanks, Melinda) The above video shows one path from the top of Svartberget to the Västra Ravinen. 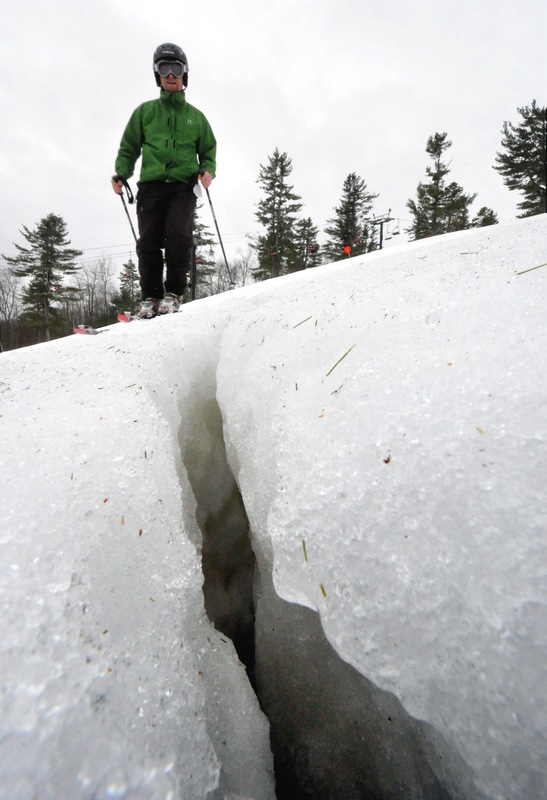 you are skiing on a river bed. Later in the spring there will be openings in the snow and ice that expose the river. And do not crash into a reindeer! The essential parameters for Åre are as follows. The Goulash index (price of soup) is 9 Euros. The maximum vertical difference is 890 meters (which can be skied in 3 minutes and 20 seconds, but who is counting). The steepest on-piste ski run is 27 degrees, but this on the almost always closed-for-races ski run, the Störtloppet. 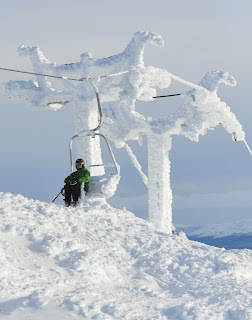 Åre has plenty of moguls skiing. When we were there a week ago they hosted the one of the world cup races in the "Slalombacken". "Hummelbranten" and, at times, "Lundsrappet" offer also some good bumps. The bumps in the children's slope were a better match for my abilities though. Åre can be reached by car, a party (!) train from Stockholm, or by flight to Östersund, 100 kilometers away. Taxi transfers are reasonable though, 29 Euros one-way. Send mail to bokning@flygtaxi.se to make a reservation. 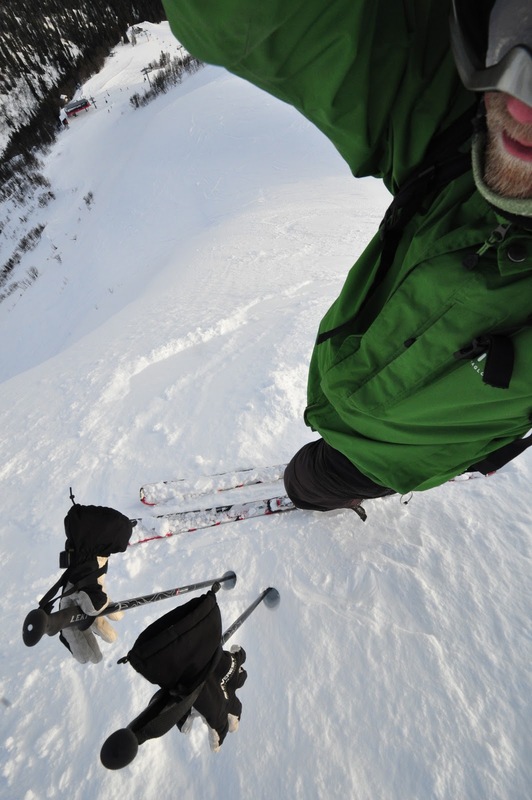 Good skiing is not limited to big mountains. Take Peuramaa as an example. This is a local hill a couple of kilometers from my office. A small hill by any standards, just 55 meters (180 feet) high. But it is a full service ski area: there's a parking lot, ticket sales booth, a couple of ski lifts, and even a bar that serves some excellent Pepsi Max for your after-ski. Or so I'm told, I would of course never go that wild in the after-ski. Seriously though, they have the playground. And I don't mean the place where you can drop off the kids so that mom and dad can go skiing. The playground is hard to define, its not any particular thing. For me its the part of the ski area that prevents me from getting bored. The part that challenges your skills, makes your muscles ache, or evokes some fear. Sometimes its a sustained, steep descent on a big mountain. Sometimes its spectacular scenery. Most of the time its something about skiing in different conditions. 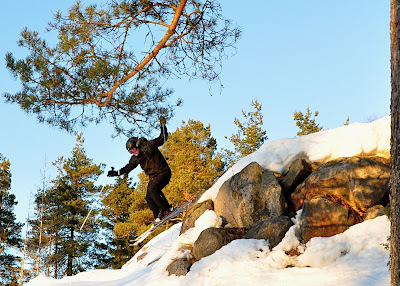 In Peuramaa its their snowboard terrain park that even the skiers can try, their surprising amount of off-piste options for such a small hill, the rocks, and the trees. So where where should you go to find the off-piste in Peuramaa? One easy-to-access place is on the far right in the map, in the small forest area between the "aurinkorinne" and the "kilparinne". This area has some rocks, drops and other terrain forms. Another interesting place is on the far left in the map, near the "magic carpet" children's lift. Right next to the top of the lift there are some trees and 5-10 meter high cliffs that are at times partially skiable, depending on snow cover. Be careful here though, there is potential for a major fall down the cliffs. The ski runs themselves are mostly boring, small runs with two exceptions. The snowboard terrain park is in the "turistirinne" and at least I was entertained by trying to learn to ski the boxes. 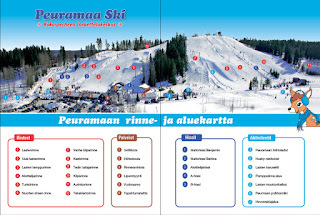 There are plenty of jumps, rails, and boxes, and Peuramaa is quite popular with the snowboarders. The "kilparinne" is the steepest and fastest run. Even if this is a very small hill, its a fast enough run that I was unable to ski it straight down without making turns or flying into air on the way. 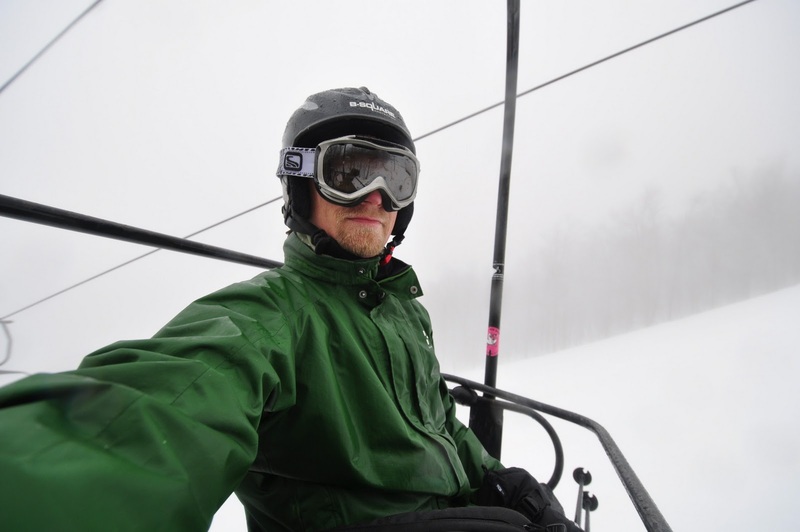 Interestingly, on my 48-hour challenge tour, I skied in a ski area in New Hampshire, and skiing it down without turns was no problem. That area is missing a playground. Mad River Glen was the main target of my weekend tour in northwestern United States. 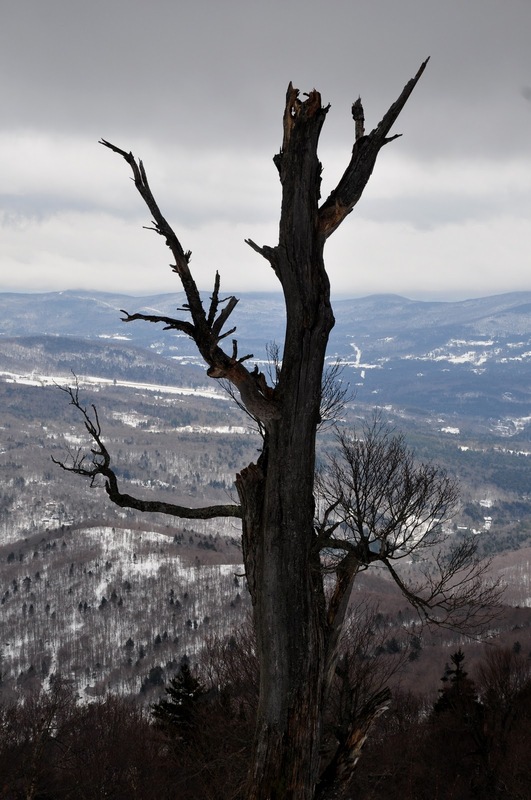 This is a rare community owned ski area and run in an old-fashioned way: most of the area is ungroomed, they run ancient ski lifts, the trails are narrow and retain their natural form and obstacles. "Cliff", "not a trail", "cliff", "not a trail", "trail". You figure it out! 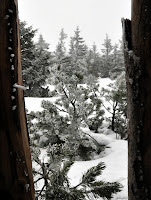 But in the afternoon I returned to the black runs. And what runs they are. 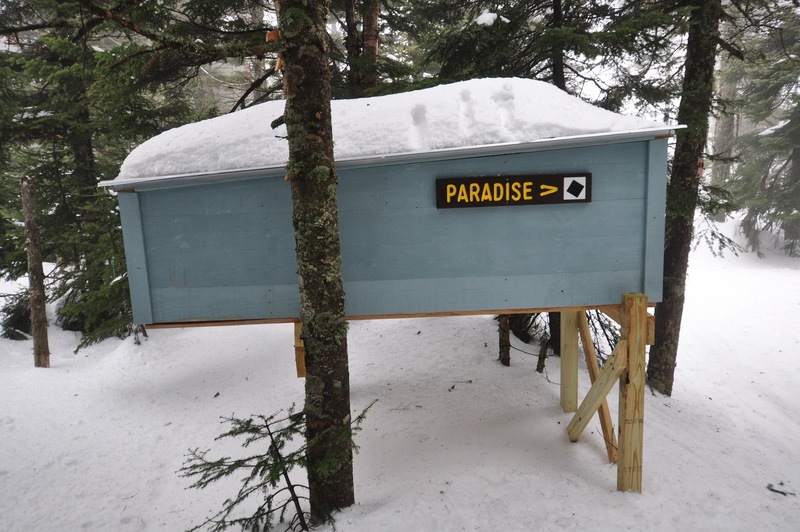 Quoting Wikipedia: "The infamous 38 degree pitch of Paradise is still only rated at a black diamond, when it would earn two or three of those diamonds at other ski areas. 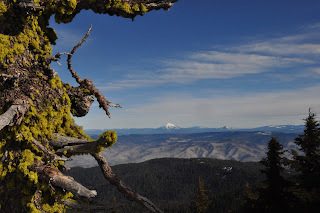 ... Mad River's most difficult marked trail is a steep, rocky, thin, and usually icy path down from the top of the mountain called Paradise. ... The entrance to the trail is not marked, although in 2004 it was added to the official trail map. The first pitch features mandatory air over a four foot (1.3 m) high frozen waterfall that spans the full width of the trail." All the terrain reachable from the single chair lift is similar: icy bumps, narrow chutes, twisting runs, gladed runs. There's another peak which also has some easier terrain, and even (gasp!) groomed trails. Boring, but useful when I got hit by the bump anxiety earlier in the morning. Mad River Glen is an affordable ski area. Lift ticket prices are similar to other places ($65 for day ticket) but other costs are very modest. Soup was 4.50$ at the Basebox and the most expensive lunch option was only $7. 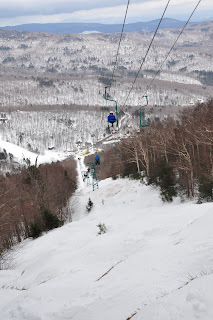 My recommended ski runs are the Chute & "Lift Line" that follow the single chair lift line. These runs have a consistent steepness all the way through to the bottom, and are generally wider than runs that go through the woods. They are also more exposed to sunshine and more likely to have patches of dirt visible. 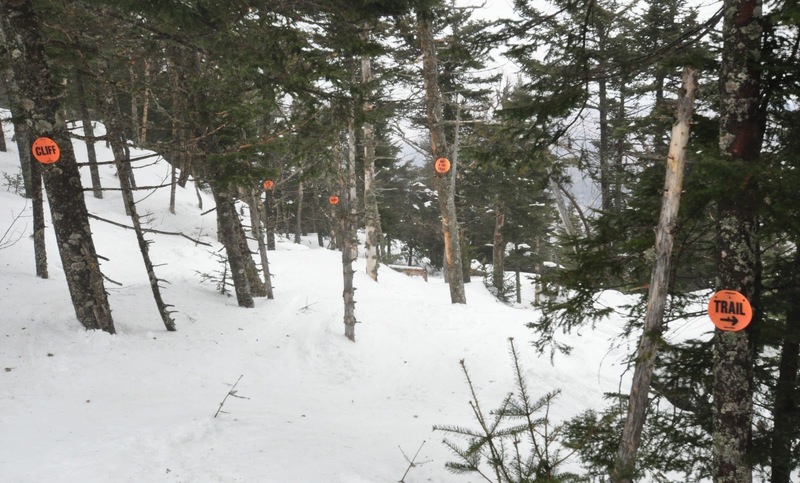 The "Beaver", "Upper Glades", and "Lower Glades" are alternate routes through the woods. "Lower Antelope" is an very narrow, twisting bump run through the woods, but requires a small hike back to the ski area at the end. "Fall Line" offers a steep run that is wider and more accessible than the Paradise. But if I had an opportunity to go to Mad River Glen again, I would spend the entire time skiing the Paradise. Someone asked me how many countries I have skied in. I had to go back and look at the records, because I didn't have a recent count. This season I have skied in 3 continents, 8 countries, 14 countries or states, and visited 18 different ski areas or sites. 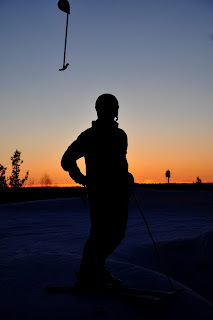 I have been on skis on 30 days, though much of it has been an hour or two in an evening, the rest is weekends and some vacation. And this was supposed to be a season where I'm not particularly trying to cover many places, just do some good skiing. Well, I have mostly been doing that, except maybe for the 48 hour challenge tour. 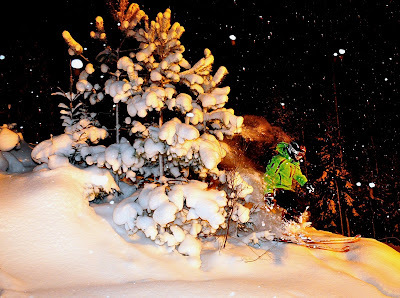 In total, I have skied in 5 continents, 17 countries, 29 countries or states and been to about 80 different ski areas. Though I might be missing a few ski areas, particularly local ones in Finland that I have visited years ago. But all in all, not that many countries! There's room for improvement. Here are the countries and states that I have skied in: USA (California, Colorado, Oregon, Nevada, Wyoming, Utah, Pennsylvania, New York, Connecticut, Vermont, New Hampshire, Maine, Massachusetts), Canada (British Columbia), Chile, New Zealand, Finland, Sweden, Norway, Switzerland, France, Austria, Italy, Germany, Belgium, Netherlands, United Arab Emirates, Indonesia, and China. 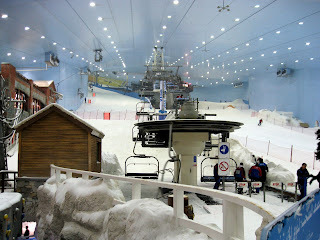 In UAE, China, Indonesia, Germany, and Netherlands I have only skied indoors, however. 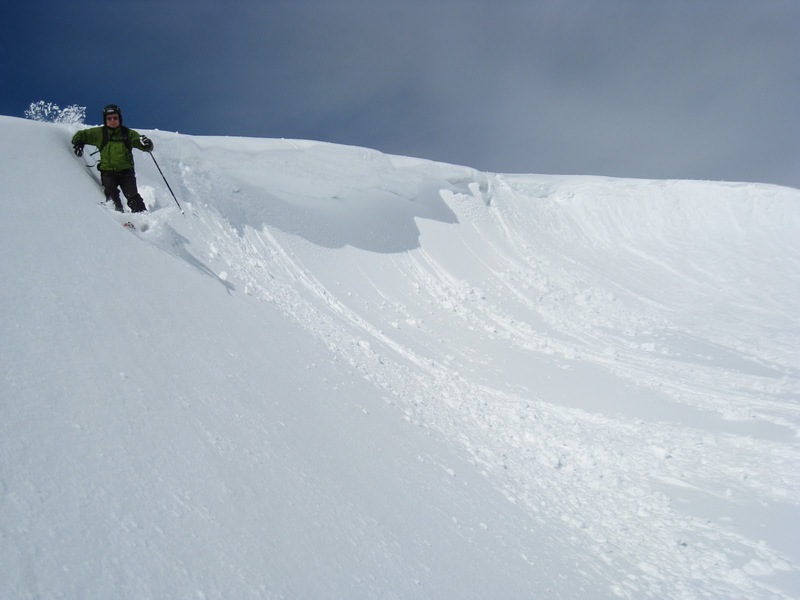 In Norway I have only skied in the summer (in the great summer ski area of Stryn). There are plenty of obvious missing destinations. Skiing somewhere in Africa, Morocco perhaps. I'll probably never get to Antarctica, but that is the other missing continent. I should also ski in Japan, Russia, Argentina, Alaska, Canada outside British Columbia, Andorra, Slovenia, Croatia, Poland, Turkey, Iran, Australia, on a real mountain in Germany and China, and many other places. If I could go back in time before the glacier in Chacaltaya, Bolivia (world's highest ski area) melted I should ski that as well. Actually, I would have done that on last year's southern hemisphere tour, but the glacier was already gone. The big turn. 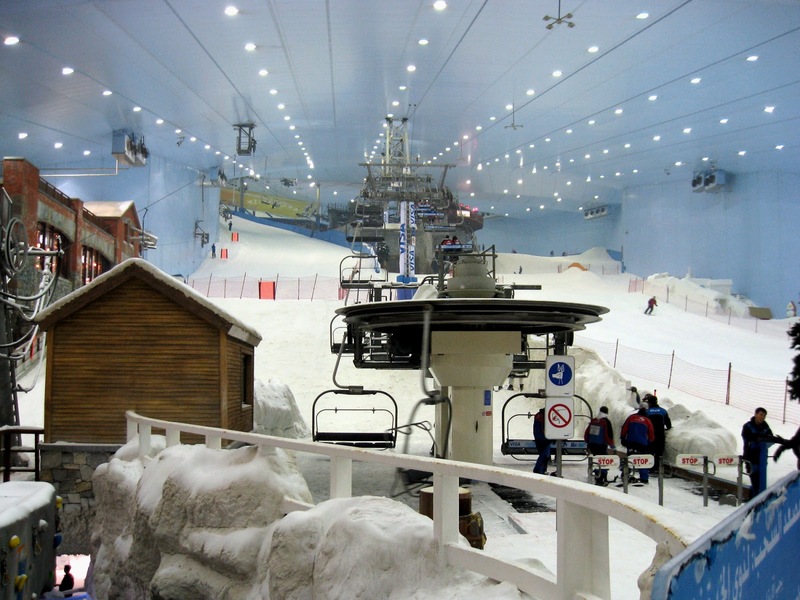 Indoor ski area, Bottrop, Germany. So what's the deal with Mongolia? Why isn't it on my list? Imagine a Friday night in Beijing, on a two week business trip. I had just begun my ski season and gotten back to the hotel from an indoor ski arena. The excitement caused me to want more, and I had the next day off. I'm looking at the map and Mongolia indeed is kind of close. I decide to ski an area near Ulan Bataar, the capitol city. Unfortunately (or fortunately, as it turns out) I can only find a flight that goes there in the morning, but there are no evening flights back to Beijing, and my meeting starts early on Sunday. So I had to abandon the idea. On the next day its pointed out to me that I have only a one-entry visa to China. Like with other great ideas at 3AM, this small detail had escaped me. Had I gotten the flights, I would have gone, would have been unable to get back, and miss my big meeting -- probably with some consequences for my employment. 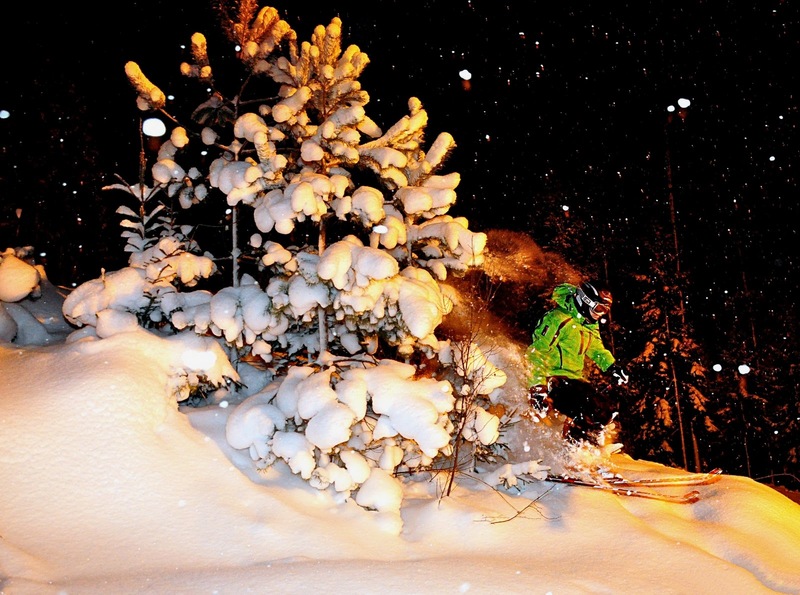 How many places have you skied in? Are there any fellow ski area baggers out there? Last week I mentioned the 48 hour challenge: to ski in as many states as possible during 48 hours. 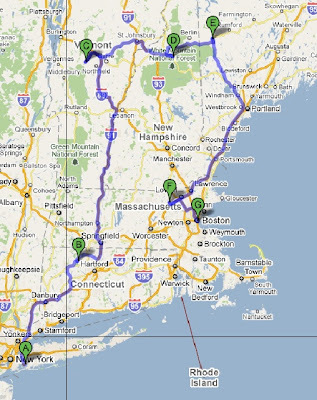 I'm now back from a 1200 km tour that covered five states: Sundown in Connecticut, Mad River Glen in Vermont, Bretton Woods in New Hampshire, Sunday River in Maine, and Nashoba Valley in Massachusetts. I did spend a lot of time in the car, but also found some truly incredible skiing along the way. I will write about this in more detail later, but the main thing I want to say now is: Mad River Glen: Just wow. Wow. 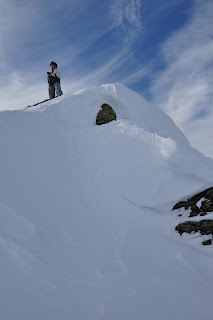 I also want to mention Nashoba Valley: an excellent place to practice crevasse rescue technique, and only half an hour from Boston. Recommended. Here is my route in more detail. It does sound like long way to drive, and it was tiresome, particularly while being jetlagged. But what made it easy was that it was broken up in shorter drives, in the morning, between the day's skiing and getting to a night ski area, and then from the night ski area to the next night's hotel. And I would have had to drive 350 km anyway just to get to my meeting. Note how different this route is from what I had originally. My friend pointed me to Nashoba (thanks Ralph! 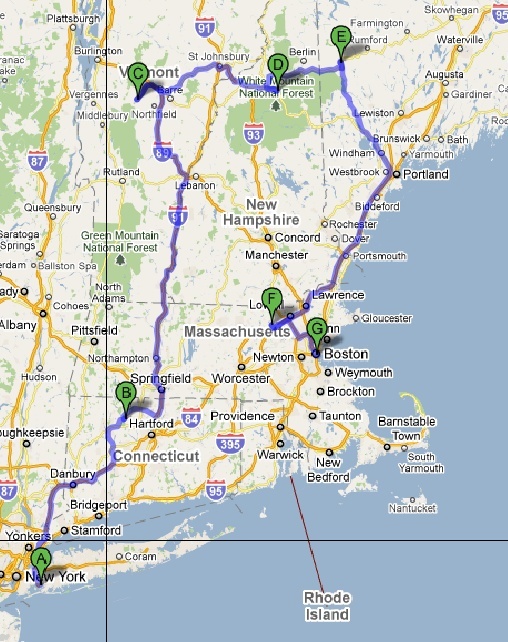 ), and picking a local hill around Boston as opposed to a far away ski area enabled me to add another state. I found all my hotels from the roadside when I needed them, staying first somewhere along the I-91 for the first night, and then in Bethel, Maine for the second night. In Bethel I can recommend the Chapman Inn for its excellent breakfast and friendly service, not to mention the open Wi-Fi. The weather on the first night was cold, winter-like. On the first day we had spring-like conditions and a bit of fog in the upper areas at Mad River Glen. On the second day it was raining. Yes, water, even the top of the mountains. And pretty heavily. Luckily this did not prevent skiing, though a few places closed a bit earlier than expected. At one point I considering a detour to ski somewhere in Quebec as well, but if I had done that I would have arrived at Nashoba Valley too late, as they closed earlier than planned. 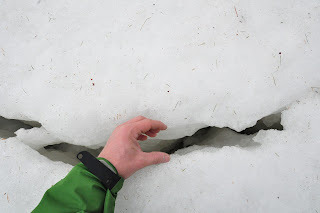 What about the crevasses? The melting snow and ice had created cracks in the ice at Nashoba. But how large they were... the first and and last picture on this blog entry is taken from the same crevasse. What a difference perspective makes on a 10mm lens! For those that have not heard of Nashoba, its a local hill outside Boston, maybe 100 feet high. Zillertal. Valley lights under a fog cover. I just came back from a weekend trip in Zillertal, Austria. It had been a long time since I visited Austria, and I had forgotten how good ski destination Austria is. 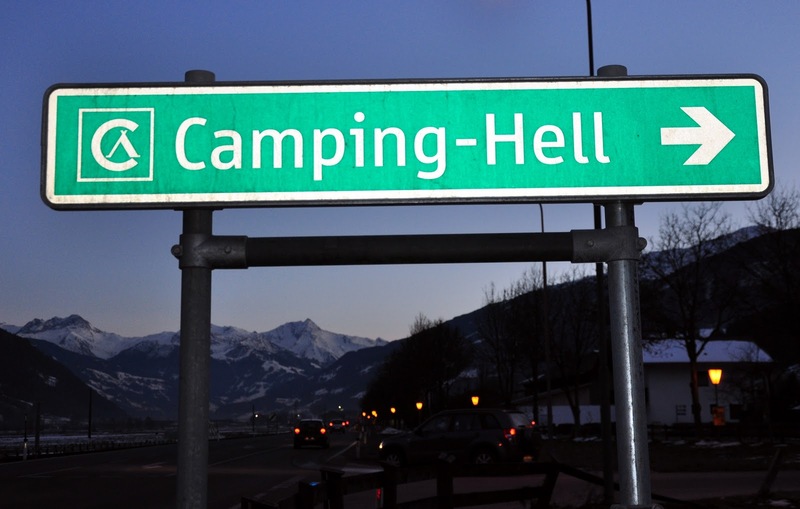 I was expecting something less than what I had been used to in France and Switzerland. Not so. Going skiing? Take the tube. In addition, Zillertal and other Austrian destinations can be done on a low budget. In Zermatt a lunch in a restaurant in the middle of the ski slopes costs 20€. At least. In Zillertal they were serving large bowls of thick Goulash soup for 4.50€. Add 3.50€ for beer. Not to mention that in Zermatt almost every restaurant even in the middle of the slopes and middle of the day was asking if we had table reservations. Don't get me wrong, I like fine dining now and then. But I came to these places to ski, not to spend a fortune and valuable time on a lunch. Then there's accommodation. Our well equipped cabin was 67€ for four nights per person. Eleven people stayed in this cabin for roughly the same price than I paid in Zermatt for three people. Finally, the flights to Munich and car rental are less expensive than in cities further south. An excellent option for the budget minded skier. I will come here again. But back to skiing. My favorite part of valley is Hochzillertal and coming down to a small side village via skiroute Aschau. This gives you a 1600 meter descent on well-groomed black run. 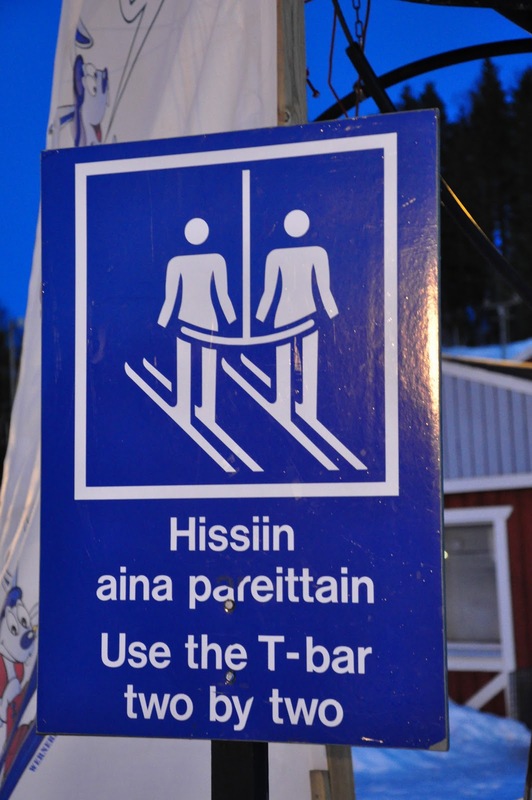 On the lower part you are unlikely to encounter other skiers, as the exit requires taking a bus back to the main lifts. But the bus connection works well and takes only a little bit of time. Recommended. Another good run is the Stephan Eberharter Goldpiste, which runs next to the main lifts in Kaltenbach. There are also very nice runs in the Hochfügen area, long, steep red runs, 700 meter vertical on one quick chair lift. The area also has a self-service GS race track, courtesy of BMW. From this area you can also access some easy off-piste runs. For instance, traverse the ridge right from the top of the Hochfügen 2000 chairlift. This gives access to a small bowl with a few steeper sections. You can reach the bottom of the lift just by skiing along the fall line. The third fun area in the valley is Penken. This area hosts Austria's steepest run, the Harakiri with its icy 35-degree slope. Note: do not be mislead by claims about this and other ski runs around the world with "78%" steepness. These numbers are measured as percentage from 45 degrees, so they sound nastier than they really are. In any case, the advertisement video for Harakiri is a must. Unfortunately this run was closed on the day that we were at Penken. As a consolation price we skied a probably steeper off-piste next to it. Austria's after-ski is naturally good. 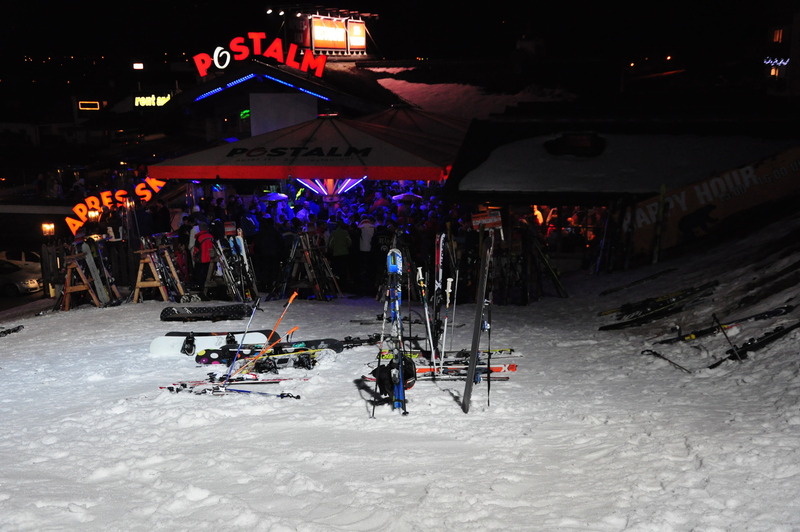 We found that Postalm in Kaltenbach is very good, right at the end of the ski runs, and packed with people. Other good places can be found from the bottom (Yeti-Bar) and top of the gondola from Scwhendau (taking you to Penken). At the top of the gondola the bar was even playing live music. Pictures (c) 2011 Jari Arkko and Ari Keränen.